Curved mouthpiece with jointed center barrel with a ring style or long shank (long shank pictured) 3-Ring in Stock. Rawhide nose band and leather curb. The Myler MB-04-SGANB starts with pressure from the nose to the cub allowing the horse the opportunity to break at the poll and relax before the mouthpiece engages. Independent side movement allows the rider/driver to pick up a shoulder independently. 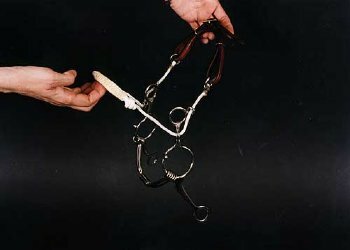 Used mainly on young horses that are just being started, as well as correcting older horses that need some tongue pressure to break at the poll.